Sorry for the absence, have been dealing with a tooth infection. Today I would like to talk about meals foods you can cook in Aluminium foil. I love these as they are quick and easy. The good thing about cooking in foil is that it lets the flavors of the food to blend without losing the juices down through the grill. There a a couple ways you can use the foil. One is to make a sort of pan by folding up the sides to create a sort of pan and the other it to fold the foil over the food and roll up the sides creating a sort of closed pocket. I think the pan method works well for fish and other quick cooking foods that you want to keep a close eye on while the pocket works well for most others. You can cook all courses of a meal in foil, right down to dessert. Who doen’t like S’Mores? Yum. I have a few recipes I would like to share with you that are my favorites, and as always, I don’t even remember where I got them so if you ever come across them let me know were. I love to give credit where credit is due. In a large bowl combine soup mix, vinegar, garlic, rosemary and oil. Add Potatos and stir til coated. Make a pocket with the foil and add potato mixture. Grill for about 40 minutes turning over once in awhile. Stir potatos and onions in olive oil until coated. Cook on the grill for about 30 minutes. While cooking combine butter, sugar, and cinnamon, mix well. Stir in pecans. When potatos are done top each with equal portions of the pecan mixture. Place a fillet on 4 seprate pieces of foil. Top with veggies and cheese evenly. Drizzle each with dressing and make into foil packets. Let sit about 15 to 20 minutes for the dressing to marinate. Grill for about 15 minutes. I have come to realize that with foil cooking, as with any grilling, don’t be afraid to try something. mmm,thanks for the recipes, and the follow! Great recipes!!! Thanks for visiting http://www.runninglovingliving.com…I am a new follower!! Stopping back to say thanks for the follow! I was already following you. Have a great week! Thanks for hopping by my blog! I'm happily returning the follow! Also following you on Net Blogs and "LIKE" you on Facebook too! I just got about 10 boxes of tin foil FREE through a coupon deal. These great recipes will come in handy! Nice! thanks for stopping by and following. I'm now following back. I always follow back. Just leave a comment telling me what you followed on and I’ll return the love. Feel free to enter some contests while you're at it. Low entries and family friendly! Upcoming Father’s Day Giveaway with over $200 in prizes!! Open Worldwide!! Thanks for joining me at Create With Joy. I am following you back! thanks so much for participating in my blog hop! following you now. Hi. Thanks for stopping by & following. I'm already following you! Hope you enjoy the cucumber salad! Since you found me through a blog hop, I wanted to be sure you know that I have a page on my site that lists more than 250 hops, memes, and photo challenges… some for each day of the week. Check under the header for the link to that page. I’ve also just started a BlogFrog community that focuses on hops, carnivals, memes, and photo challenges. Go to http://theblogfrog.com/1504201 to visit & participate. I hope you’ll visit me soon again! My husband used to make a full meal in tin foil called "HoBo Chicken" and he'd wrap up chicken with veggies and potatoes and then cook it on the grill — it was always so good. There's just something great about cooking things on the grill wrapped in tin foil. We will have to try your recipes, especially the one with the pecans – yum! Thanks for stopping by Mom Always Finds Out on the hop, I'm already a GFC & Facebook fan of yours, and now I'm a new Networked Blogs follower. I love grilling out & am so happy it's summertime and we can do it more often. Grilled sweet potatoes are a favorite in this house. We simply cut in half, brush with oil and then grill for 25 – 30 minutes, then top with a tiny bit of butter and eat like a baked potato. Yum yum. Will have to try the other recipes as I'm always looking for new grilling secrets. 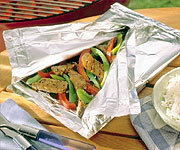 I use foil wraps when grilling thin white fish a good bit. Awesome ideas! I love making red potatoes on the grill in a foil pouch. I need to try your recipe, never thought to use the soup mix! Following you back from the weekend blog hop! Hi Michelle! I can use all the help I can get in the cooking department. I love to use foil packets on the grill! It makes clan up a sanp and the food is oh so yummy! Thanks for stopping by my blog, returning the favor. I've used foil packets in my oven since I was a kid. Usually something like hobo dinners or fish in parchment paper. Thanks for sharing your recipes. I'll give them a try (in my oven lol). I love cooking in foil! We put a pork chop, sliced onions and sliced potatoes in foil & cook in the oven and they are delicious. The meat just falls off the bone and clean up is so simple!